Though really too late to do anything worthwhile against the Allied air juggernaut, the Bf-109G-10 was really the last of the 109 versions, the K-4 actually reaching units a bit before the G-10. In reality, there was little to choose between the K-4 and the G-10 aside from a few minor things. Both had the latest DB.605D engine, upgraded airframe components and pretty much the same armament, though that varied. Prior to this kit, your sole option in standard 1/72 injection molded kits was one by Revell AG that had some rather odd anomalies in terms of what it offered. The greatest of these were the molded in, two piece head armor and the filled in supercharger intake. I know these prevented me from building the kit. Well, the folks at Fine Molds are nothing if not fanatics about accuracy. Despite the seemingly high price of this kit, your only other options are some even more expensive resin ones. 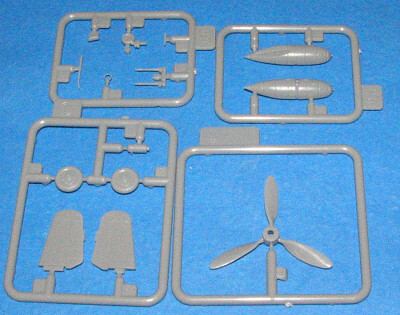 Fine Molds has provided sprues that offer all of the options that can be found on the G-10. There are two types of wooden rudder, the extended tail wheel, large and small upper wing wheel fairings, deeper oil cooler, larger paddle bladed prop, Erla Haube canopy and the correct fuselage with the more common improved upper engine cowling. This has the later 'Type 120' version and not the much more rare 'Type 110' cowling. The sprue with the wings is the same as in all the 109F/G kits so I've not shown that one. 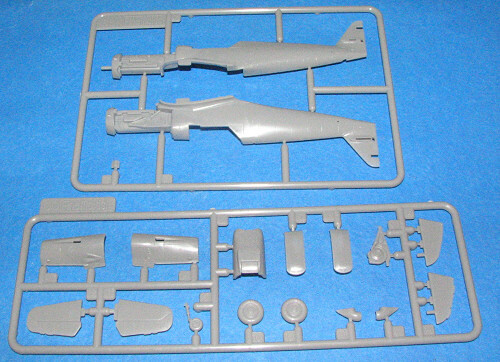 Instead, you will see the sprues with the fuselage and the other optional bits. Not all of these will be used for it seems that the majority of G-10 airframes did not have the super wide wheels and so the large wheel fairings will not be used if you are planning on doing the aircraft shown on the box art. The kit as shown will use the tall tail wheel and the rudder with two trim tabs. There is even the little box fairing for the back of the interior that provides clearance for the MW 50 water/alcohol injection system, one of the key visual clues for the G-10. With all the additional bits, you can really do any of the G-10s built if you have the decals and some sort of reference. Many were built with wider wheels and using the shorter tail wheel; especially if rebuilt from a G-6/14 airframe. Instructions are like all Fine Molds kits and in Japanese with minimal English. They are well drawn with lots of good info and excellent construction sequences. Colors given are in generic, Gunze and Tamiya paints. The lone decal option is for Blue 4 from 8./JG 3 during 1945 as flown by Oblt. Gunther Grossjohan. It is in RLM 81/83 over RLM 76 with 81/83 mottling. The two standard insignia/stencil decal sheets are provided along with one for the specific aircraft. Printing in very good and these should work quite well with setting solutions. I'm pretty impressed with this kit. I've built the109F-4 by these folks and had no trouble at all with the construction. You do need to be a bit careful in construction as this isn't totally foolproof. The end result will be an accurate 109G-10, something 109 Nutz have been awaiting for a very long time. My thanks to www.wingsntreads.com for the review kit. You can order yours on-line.